It’s the most given of givens: Moms love their kids. But not for Jennifer Rabiner*. In this riveting confession, she admits that her young daughter disappointed her from day one. A mom is never, ever supposed to admit this, but here goes: I’ve never liked my child. Growing up, I had hoped to someday have a daughter, and I had a clear vision of what she would be like: vivacious, spunky, and whip-smart, socially savvy and self-assured. What I got was the polar opposite. At birth, Sophie was skinny and weak. She nursed poorly, and she cried so hard that she vomited — daily. As a toddler, she was strange. She wouldn’t make eye contact, and she’d scream bloody murder at the sound of ripping paper. Instead of scribbling with crayons, she’d line them up at the edge of the paper. She’d climb to the top of the slide and then cry to be rescued. She couldn’t — or wouldn’t — answer direct questions. She didn’t make friends. Life seemed hard for her. It broke my heart a little every day. As you can probably imagine, I felt guilty that I was basically repelled by my own child. Who wouldn’t? But honestly, the guilt was overshadowed by a colossal sense of disappointment. This just wasn’t the magic mother-daughter bond that every book I read, every movie I saw, and every family I’d ever met had led me to expect. When Sophie was 18 months old, we visited my sister, now a psychologist, who said out of the blue, “You know, Sophie is an odd kid.” I asked what she meant. “She’s just kind of — off,” she said. Her comment upset me but only confirmed my suspicions that Sophie might be on the autism spectrum. I spoke to her day-care director and had her tested by the school district. Neither found anything wrong. I found a pediatric neurologist, but when they sent me forms to fill out, Sophie had none of the physical symptoms in the boxes under “Reason for Visit.” I canceled the appointment. My husband accused me of searching for a diagnosis that didn’t exist, but I needed to know why my daughter wasn’t meeting her developmental milestones, let alone my expectations. I might have thought I was lacking a maternal instinct, but when my second daughter was born, I was blown away by overwhelming Mommy Love. Lilah was exactly the baby I’d envisioned: strong and healthy, with a penetrating gaze. She nursed vigorously and smiled and laughed easily. She talked early and often and, even as a toddler, befriended everyone she met. When I hugged her, she squeezed back hard, and I felt my own heart beating in two bodies at once. As Lilah grew healthy and robust, Sophie looked noticeably meek by comparison. It’s true that I, like all my relatives, am petite, but Sophie was beyond small — weak, skinny, and pale. The contrasts between Lilah and Sophie went beyond the physical. There was Lilah, initiating a joyous game of peekaboo at 6 months, while her sister, then 3, sat on the floor babbling phrases from books and TV shows. We’d ask, “Sophie, wanna join the game?” And she’d say: “Look, a clue! Where? Over there!” I called it her Rain Man act. It got to the point where I viewed Sophie’s every move through a lens of failure. At a birthday party, when she walked away from the parachute game the other kids were playing, I said, “There she goes again, being antisocial.” But another mom said, “Sophie’s doing her own thing. She wants no part of that dumb parachute. Smart girl.” I thought, Whoa! I would never have seen it that way. To me, she was trapped in her own strange world, driven by her own mysterious motivations, and hopelessly incapable of being normal. I knew I was being hard on her, but I couldn’t seem to stop. A moment of reckoning came when Sophie was 4, at a playdate with my best friend and her daughter. I was judging Sophie as usual, criticizing how she was painting with the stick part of the paintbrush instead of the bristles, when my friend turned to me and said point-blank: “You are Sophie’s mother. You’re supposed to be her rock — the person she can count on most in the world for unconditional love and support. It doesn’t matter if you like her or not; you still have to support her.” I started to cry, because I knew she was right. And deep down, I was ashamed of how easily I had betrayed my own daughter. If I looked at my behavior objectively, it was disgusting. Has uneven skills (as a toddler, she knew the whole alphabet and could count to 60, but could barely string three words together). Hurts herself, perhaps out of anxiety (used to tear out clumps of hair, then began scratching herself). Doesn’t express needs or even recognize them (will cry when hungry even as her peers use full sentences). Freaks out at high-pitched noises (like the beeping of an ATM). Prefers to play alone (when other kids try to play with her, she ignores them, or tries to play but doesn’t seem to grasp how). She nodded as I listed my grievances, and I got excited, expecting to hear a diagnosis that would finally make sense of Sophie’s quirks and lead to an effective treatment. But no luck. She felt I wasn’t attuned to Sophie’s vulnerabilities — she’s a sensitive soul; I’m a bull-in-a-china-shop type. But something is wrong with my child, I kept thinking. Why can’t anyone else see it? Instead, she made suggestions designed to help me bond with her. I took notes. The first thing I had to do, said the psychologist, was identify my expectations of Sophie so I could understand whether they were realistic or unachievable. As long as I wanted her to be someone she could never be, I was setting her up to fail, in my eyes, every single day. I explained that I wanted Sophie to make eye contact. “That’s too hard for her,” the psychologist said, recalling my own checklist. “She’s acutely sensitive — you whisper, and for her it’s like a megaphone.” I realized that I wished Sophie were tougher (she’s hypersensitive), more outgoing (she’s shy), and “cool” (even now, as a 9-year-old, she favors kittens and angels). Scrap those things. Start over. I needed to stop seeing what Sophie was not and start seeing what shewas. A few months later, when Sophie drew a unicorn on a piece of construction paper and said she wanted to use it for her birthday party invitation, I resisted the temptation to hide it in the garbage and order glossy invites instead. Color copies of Sophie’s rainbow unicorn went out to 45 kids — and I got emails raving about it! Score one for Sophie. Still, denying my expectations day after day was hard. I wondered if my upbringing may have set the bar too high. As the daughter of a local politician, I was expected to be a role model — to dress appropriately, smile and make small talk, write thoughtful thank-you notes. And I was a natural. My mother used to say, “Nothing succeeds like success,” and I stepped up. Why couldn’t Sophie? I tried to ignore my gut instinct that something still wasn’t quite right. The psychologist recommended that I connect with Sophie over something she enjoys, and as much as Calico Critters weren’t my thing, I vowed to try. A few days later, I found her poring over a Mini Boden catalog. Aha! We shared a love of shopping! It might not be the most wholesome or financially sustainable hobby, but we needed to start somewhere. I plopped down next to her and asked, “If you could get one thing on each page, what would it be?” My sister and I had played this game as kids, and Sophie caught on instantly. Too bad life isn’t one big catalog game. Then, when Sophie was 7, a stunning revelation rocked our family’s world. At the prompting of our pediatrician, who was concerned about Sophie’s sluggish growth, she was tested and diagnosed with a growth hormone deficiency that had slowed her development across the board since birth. Her speech, motor skills, and social maturation were three years behind schedule. Wow! It wasn’t the diagnosis I expected, but it made sense. Growth hormone regulates so many functions in the body; Sophie’s lack of it explained everything from her blue moods and anxious behaviors to her difficulty communicating to her birdlike appetite and negligible muscle tone. My first reaction was relief — a diagnosis! Then hope — help is on the way! Then guilt. All this time, Sophie was struggling. She was 7 by the calendar but only 4 by her own body clock, a pre-K’er thrust into second grade. She was coping with enormous challenges every day without a mother who believed in her. Even worse, I had resented her for letting me down, when it was I who was letting her down. I instantly regretted scads of horrible things I’d said to her over the years and prayed that the damage wasn’t irreparable. What a wake-up call. As the diagnosis sank in, I found myself feeling more tender, more motherly toward Sophie. Instead of me pitted against her, it’s now us, together, pitted against this diagnosis. My husband is cautiously optimistic about the treatment (nightly hormone shots) but concerned about possible side effects. After all, he has accepted her as is all along. The happy dance I’m doing over this diagnosis is mine alone. Whether I’ve finally learned to be a good parent to Sophie — or in spite of the fact that I haven’t — my now-9-year-old is in a pretty good place. The hormone shots have delivered positive effects beyond inches and pounds. Sophie competes on the local gymnastics team, aces her spelling tests, goes on loads of playdates, and loves to download songs for her iPod. She makes eye contact and answers direct questions. I’m pretty sure she’s genuinely happy most of the time, though she’s still fairly anxious and still occasionally meows and shrieks. I watch her sometimes, looking for clues of the emotional scarring I fear I’ve inflicted, but I see none. Instead, she takes running leaps into my arms, her strong legs squeezing my middle in her signature “cobra hug.” Do we see eye to eye? Almost never. But do I try to prop her up every single day anyway? Yes, I do. After all, I’m her mom. The author’s husband knows she says some harsh, even shocking things in this essay. Here’s what he’d like you to know about the woman behind those words. My wife likes to fix things. She’s an extrovert, a fighter. Her greatest fear is being alone. As a parent, it’s hard to watch your child, this tiny creature you love more than yourself, struggle and remove herself from the group; harder still when you’re a parent with a personality like Jenny’s. Try as she might, Jenny couldn’t “fix” Sophie, and I think that scared her. The search to find something wrong was her quest for an instruction booklet. But sometimes things aren’t broken, they’re just different and built to excel at things you’re not. There’s a laundry list of things no one ever tells you when you have children. One of them is that your child will teach you how to be the parent they need — if you’re willing to listen. And I know Jenny is listening, because whenever Sophie has good news to share, a problem to solve, or a hurt to soothe, she goes looking for Mommy first. My personality type loves deeper meaning and symbolism. God uses both these things quite often in the Bible if we know where and how to look for them. So look at what I found that lends so much more meaning to Pentecost. This was taken from “The Untold Story of the New Testament Church” by Frank Viola. About 120 Jewish disciples of Jesus hold a prayer meeting in the upper room of a house in Jerusalem where they all have been living. The house probably belongs to Mary, John Mark’s mother. The twelve are present. Also in attendance is Jesus’ mother Mary and Jesus’ brothers. 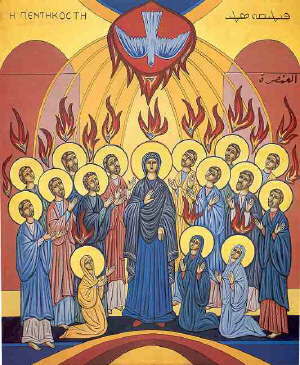 It is the day of Pentecost. Jews from all across the Roman empire have come to Jerusalem to celebrate the feast. They have come from as far as Asia Minor and Arabia. The empire is currently enjoying Pax Romana (“Roman Peace”). For the most part life in the empire is safe with a population of between 70-100,000 million people. Of that population about half are slaves and the empire is run on slave labor. Slaves have no legal rights and are viewed as property. Some wealthy Romans own as many as 20,000 slaves. More than half the population is dependent on the regular distribution of free grain. There are between 3 and 8 million jews in the Empire with 2/3 of them living outside Palestine. Jews are seen as having strange beliefs and circumcision is seen as mutilation and the Sabbath as a cloak for laziness. As a result they are despised by most Greeks and Romans. Jerusalem as a city is less than one square mile. The normal population is 60,000. Most are Jewish. During Pentecost, there are more than 125,000 – 500,000 added to the population. Luke mentions 16 different countries represented. It is 9:00 AM. A priest has prepared two loaves of leavened bread. He pours oil on them and slips them into the oven to be baked together. At the same moment the Holy Spirit descends into the upper room where the 120 are staying. The Spirit fills the 120. One result is that they speak in languages they have never learned. Because of this, those visiting from around the Roman Empire hear God being magnified in their own language and dialect. Significantly the day of Pentecost has always been associated with the gicing of the law. According to tradition, the law was supernaturally uttered from Sinai in the 70 languages of the nations of the world. With the filling of the 120, spiritually speaking “the first load of bread has been baked”. Ten years will pass and then the Gentiles will be baptized into the family – the “second loaf”. So the two oil covered (Holy Spirit covered/filled) loaves will find their fulfillment. The noise in the upper room provokes a crowd of Jews to see what is going on. They are bewildered to hear many of their own dialects. Peter preaches Jesus to a Jewish audience. Three thousand Jews respond. The twelve are performing signs and wonders in the city. The church is in awe as it beholds God’s power made visible. I love how God chooses to speak a deeper language by having events such as the pouring out of the Holy Spirit and the Crucifixion take place on deeply meaningful cultural or historical events so that so much more meaning and understanding can be attained for those who can “see” it. Seek and you shall find. So lets look at the covenant making ceremony from a new perspective. The New Covenant is better than the Old Covenant. Hebrews 7:22 This makes Jesus the guarantee of a far better way between us and God-one that really works! A new covenant. Hebrews 8:6 But Jesus’ priestly work far surpasses what these other priests do, since he’s working from a far better plan.7 If the first plan-the old covenant-had worked out, a second wouldn’t have been needed.8 But we know the first was found wanting, because God said, Heads up! The days are coming when I’ll set up a new plan for dealing with Israel and Judah.9 I’ll throw out the old plan I set up with their ancestors when I led them by the hand out of Egypt. They didn’t keep their part of the bargain, so I looked away and let it go.10 This new plan I’m making with Israel isn’t going to be written on paper, isn’t going to be chiseled in stone; This time I’m writing out the plan in them, carving it on the lining of their hearts. I’ll be their God, they’ll be my people.11 They won’t go to school to learn about me, or buy a book called God in Five Easy Lessons. They’ll all get to know me firsthand, the little and the big, the small and the great.12 They’ll get to know me by being kindly forgiven, with the slate of their sins forever wiped clean.13 By coming up with a new plan, a new covenant between God and his people, God put the old plan on the shelf. And there it stays, gathering dust. The Old Testament uses the word “atonement” which means to over sins. This word virtually disappears in the New Testament. In the Old Testament – sins were covered. In the New Testament – are sins are wiped away. They are gone. We swapped clothes with Jesus and he wrapped us in “robes of righteousness”. Jesus took on our flesh and our “sin clothing”. Philippians 2:7 When the time came, he set aside the privileges of deity and took on the status of a slave, became human!8 Having become human, he stayed human. It was an incredibly humbling process. He didn’t claim special privileges. Instead, he lived a selfless, obedient life and then died a selfless, obedient death-and the worst kind of death at that: a crucifixion. Then the exchange of belts. 2 Corinthians 12:9 My strength comes into its own in your weakness. Once I heard that, I was glad to let it happen. I quit focusing on the handicap and began appreciating the gift. It was a case of Christ’s strength moving in on my weakness.10 Now I take limitations in stride, and with good cheer, these limitations that cut me down to size-abuse, accidents, opposition, bad breaks. I just let Christ take over! And so the weaker I get, the stronger I become. Ephesians 6:10 And that about wraps it up. God is strong, and he wants you strong.11 So take everything the Master has set out for you, well-made weapons of the best materials. And put them to use so you will be able to stand up to everything the Devil throws your way. 13 Be prepared. You’re up against far more than you can handle on your own. Take all the help you can get, every weapon God has issued, so that when it’s all over but the shouting you’ll still be on your feet.14 Truth, righteousness,15 peace,16 faith,17 and salvation are more than words. Learn how to apply them. You’ll need them throughout your life. God’s Word is an indispensable weapon. 19-21 So, friends, we can now-without hesitation-walk right up to God, into “the Holy Place.” Jesus has cleared the way by the blood of his sacrifice, acting as our priest before God. The “curtain” into God’s presence is his body. 22 So let’s do it-full of belief, confident that we’re presentable inside and out.23 Let’s keep a firm grip on the promises that keep us going. He always keeps his word. Luke 17:33 If you grasp and cling to life on your terms, you’ll lose it, but if you let that life go, you’ll get life on God’s terms. New Covenant: Romans 2:28 Don’t you see: It’s not the cut of a knife that makes a Jew.29 You become a Jew by who you are. It’s the mark of God on your heart, not of a knife on your skin, that makes a Jew. Romans 8:17 And we know we are going to get what’s coming to us-an unbelievable inheritance! There are no curses mentioned in the New Testament because Jesus absorbed them. Jesus is saying “I am your covenant meal”. I Corinthians 11:23 Let me go over with you again exactly what goes on in the Lord’s Supper and why it is so centrally important. I received my instructions from the Master himself and passed them on to you. The Master, Jesus, on the night of his betrayal, took bread.24 Having given thanks, he broke it and said, This is my body, broken for you. Do this to remember me.25 After supper, he did the same thing with the cup: This cup is my blood, my new covenant with you. Each time you drink this cup, remember me.26 What you must solemnly realize is that every time you eat this bread and every time you drink this cup, you reenact in your words and actions the death of the Master. We become “Christ-ians” and Jesus referred to Himself as the “Son of Man”. In the culture of Abraham, it was common for tribal chiefs or heads of city-states to enter into covenants or alliances with one another. So when God wanted to communicate to humanity, He used the covenant because it was the vehicle that people would immediately understand. Entering into covenant was a language that even the pagan cultures would understand. 1. The exchange of robes. This represented an exchange of identity. 2. The exchange of belts. This represented an exchange of strength. 3. The exchange of weapons. This symbolized an exchange of enemies. 4. The sacrifice of an animal. The animal must be cut in two and this is where the “blood” of the “blood covenant” comes from. 5. The “walk of death”. At this point in the ceremony, the covenant partners stood facing each other in an open field. The animal lay cut open between them. The partners literally walked through the mass of blood. One would walk through and come back on the left side. The other would come back through turning to the right. Together the patterned a figure eight. 6. They marked their bodies. In the old culture it was the “striking of hands”. In the Hebrew culture, the hands included the wrist. The covenant partners made an incision in their wrist and the two would then put their wrists together mingling their blood. This suggests the origin of the handshake or hand clasp. 7. The pronouncement of blessing and curses. At this point in the ceremony the partners faced each other and spoke the terms of keeping the covenant – the good things that would happen if it was kept and the bad things that would happen if it was broken. 8. The covenant meal. The covenant partners sat at a table before witnesses and shared a meal. But the partners did not begin by feeding themselves. Thye fed each other the first few bites saying “As you are ingesting this food, you are ingesting me; you are taking me into your life”. This is where the wedding custom of the bride and groom feeding each other cake comes from. 9. The exchange of names. A good example of this would be a wife taking the last name of her husband in current society’s wedding ceremony. This way when people introduced themselves you would know who their covenant partner is. I had always been taught about salvation using the model of a courtroom and I was the condemned prisoner and the Judge took my place. That model is useful but there was something that seemed missing for me in scripture as I read the writer’s accounts. Like they knew something I didn’t. 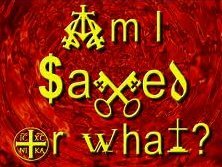 There was something that they knew that interpreted the cross, the shedding of Jesus blood and the Resurrection. Prayer fell in the same category: what did it mean to pray in the name of Jesus? 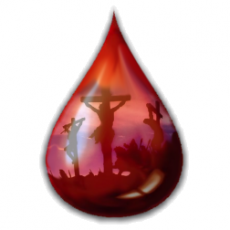 What was missing was the understanding of God’s blood covenant with His people. Understanding this is tantamount to handing you a new Bible. Does your spiritual life consist of a weekly round of church services, attempts at Bible study and prayer and trying to keep rules that deal mostly with the physical life? Then read on. The concept of a covenant is almost unknown to the Western world. But this concept is known in ancient societies and the third world even today. Remember how we used to hear in westerns the term “blood brothers” used by the American Indians? Well this had to do with swearing loyalty to one another and that is exactly what a blood covenant is, but there is so much more to it. The people in the pages of the Bible knew all about covenants. The Bible is divided into two main parts we call “Testaments”, but the correct term is Old Covenant and New Covenant. The Old Covenant was a covenant made with Abraham and his descendants. The New Covenant is a covenant made through Jesus which does away with the provisions of the old one and starts something “new”. A covenant is literally a binding obligation. It is the ultimate expression of committed love and trust and was usually made to define and make binding a relationship that had been in the making for some time. A covenant is not a contract. A covenant is the giving of one’s whole person and life to another and the whole hearted receiving of the other person and his or her life. So when one people group was going to make a covenant with another people group, they both picked someone to represent them. This person could speak and act with authority on behalf of group. For all effective purposes, they were the group. Promises, terms and responsibilities were often written down and read at specified times in remembrance of the covenant being made. See I Samuel 20:14-15 and II Samuel 9:7. Am I saved or what? I think this question is asked allot by people……….just not out loud. It is one of those questions that is almost too scary to think about and too awkward to bring up. If you have considered yourself a Christ follower who wants to admit they are not sure, read on. Let me give some help here in actually determining this. So the genuine evidence of having accepted God’s forgiveness for sin through Jesus Christ and accepting Him as Lord is the presence of the Holy Spirit within us. So it would be nice to be able to have a “Holy Spirit detector” that would “beep” when the Holy Spirit was present. And even though no one (not even Apple has an App for that) has invented this yet, lets look at the Holy Spirit “detectors” we are given in the Bible. 1. Romans 8:16 says “God’s Spirit touches our spirits and confirms who we really are. We know who he is, and we know who we are: Father and children.” So the indwelling Holy Spirit should be reassuring us. So we see here keeping God’s commandments/trying to live like Jesus, loving people, sharing God with others. 4. 2 Peter 2:7-8 “But that good man Lot, driven nearly out of his mind by the sexual filth and perversity, was rescued. Surrounded by moral rot day after day after day, that righteous man was in constant torment.” Do you react to the sin you see around you in the culture? When you see blatant sin in a movie does your spirit react? 5. Do you actually enjoy giving to the Lord’s work? Do you give generously of your time, talent, and treasury? 6. Do you sin less now than you did prior to receiving Christ? 7. Have other people seen the “fruit of the Spirit” at work in your life? Anyway, these are just some of the ways. If you still have doubts, pursue them so you can come to a place of peace about this. That’s pretty inclusive. Well “all voices in all places” reminds me of the virtual choir project that was done purely online gathering voices from all over the world. I like to think this video is just a taste of the heaven to come. The song’s official title is Adeste Fideles and despite the common belief that the lyrics were written by St. Bonaventure, the song was penned by English Catholic priest John Francis Wade. Wade, 35, had fled to France in 1745, where he spent his time translating and preserving old church music. Inspired by the ancient music he was studying, Wade wrote Adeste Fideles which was first published in France. Collins speculates that because of Wade’s status as a leader of the English Catholic revolution at the time and his refusal to take an oath of allegiance to the Church of England, his name was deleted when Frederick Oakeley translated the original lyrics into English in 1841. Soon after St. Bonaventure was given credit for the song’s words. Moved by his own work, Cappeau decided that his “Cantique de Noel” was not just a poem, but a song in need of a master musician’s hand. Not musically inclined himself, the poet turned to one of his friends, Adolphe-Charles Adam, for help. The son of a well-known classical musician, Adam had studied in the Paris conservatoire. His talent and fame brought requests to write works for orchestras and ballets all over the world. Yet the lyrics that his friend Cappeau gave him must have challenged the composer in a fashion unlike anything he received from London, Berlin, or St. Petersburg. Initially, “Cantique de Noel” was wholeheartedly accepted by the church in France and the song quickly found its way into various Catholic Christmas services. But when Placide Cappeau walked away from the church and became a part of the socialist movement, and church leaders discovered that Adam was a Jew, the song–which had quickly grown to be one of the most beloved Christmas songs in France–was suddenly and uniformly denounced by the church. The heads of the French Catholic church of the time deemed “Cantique de Noel” as unfit for church services because of its lack of musical taste and “total absence of the spirit of religion.” Yet even as the church tried to bury the Christmas song, the French people continued to sing it, and a decade later a reclusive American writer brought it to a whole new audience halfway around the world. Not only did this American writer–John Sullivan Dwight–feel that this wonderful Christmas song needed to be introduced to America, he saw something else in the song that moved him beyond the story of the birth of Christ. An ardent abolitionist, Dwight strongly identified with the lines of the third verse: “Truly he taught us to love one another; his law is love and his gospel is peace. Chains shall he break, for the slave is our brother; and in his name all oppression shall cease.” The text supported Dwight’s own view of slavery in the South. Published in his magazine, Dwight’s English translation of “O Holy Night” quickly found favor in America, especially in the North during the Civil War. In 1906, Reginald Fessenden–a 33-year-old university professor and former chief chemist for Thomas Edison–did something long thought impossible. Using a new type of generator, Fessenden spoke into a microphone and, for the first time in history, a man’s voice was broadcast over the airwaves: “And it came to pass in those days, that there went out a decree from Caesar Augustus, that all the world should be taxed,” he began in a clear, strong voice, hoping he was reaching across the distances he supposed he would. Reprinted from “Stories Behind the Best-Loved Songs of Christmas” for educational purposes only, from Zondervan.